I did some volunteering here and there for one of my favourite organisations Open Australia. This included occasionally managing the twitter handle for their project “Election Leaflets“. My job was to tweet and answer questions. I began noticing some patterns and then dug a little deeper to see what it all meant. I wrote up my research in an article: Scrutinising the Audience Experience of Election Leaflets. Towards the end I made an observation about MVPs — minimum viable products, that distinguishes them from minimum viable experiences. In this case the MVP certainly proved the capability of the product and found a product market fit for those already familiar with Open Australia. The next step was to evolve the product into an experience that would see it expand to serve a new “market”, of politically engaged people unfamiliar with Open Australia and make the usability of the publishing flow more transparent. Read the article for the full context but in the meantime consider whether your MVP caters to the needs of your audience across their end-to-end journey. 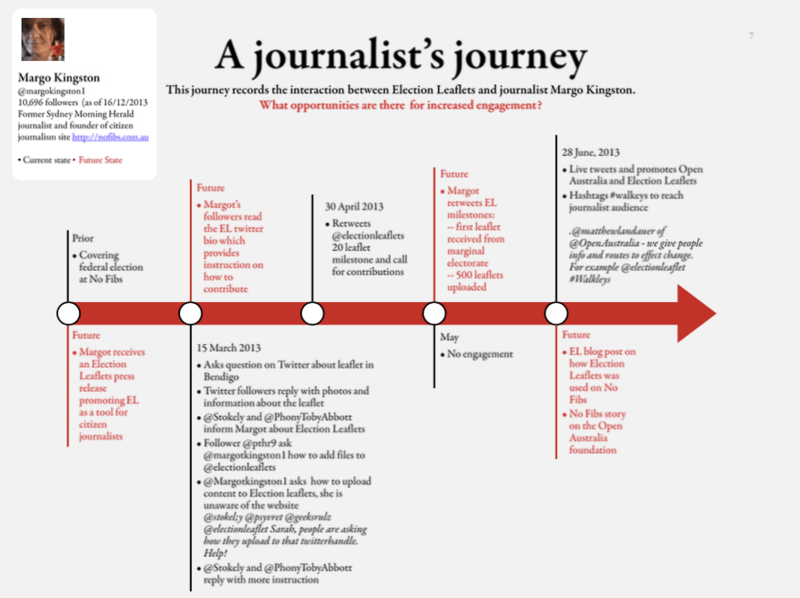 Election Leaflets Twitter User Journey revealed some break points in the experience with the product where how to contribute was not clear for unfamiliar but engaged users.